Weighted wavelet z-transform of γ-ray light curve for the blazar Mrk 501. The left panel shows the distribution of color-scaled WWZ power in the time-period plane, and the right panel shows the time averaged power (blue curve) as a function of period. The magenta and the red curves show the 90 and 99 percent local significance contours, respectively, from the MC simulations. Credit: Bhatta et al., 2018. 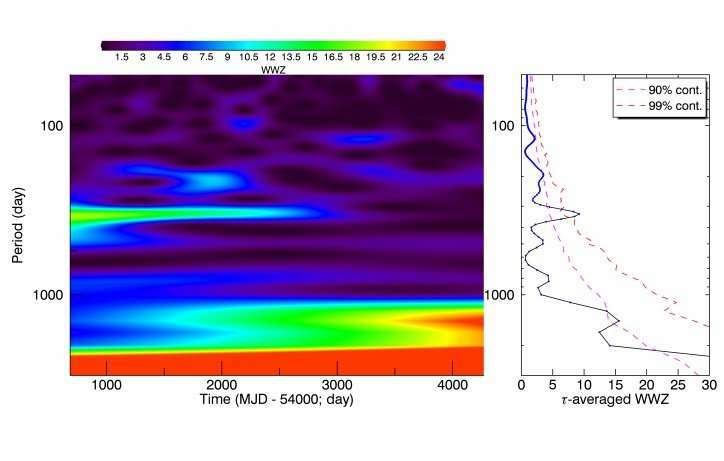 Astronomers have detected transient rhythmic oscillations in the gamma-ray emission from the blazar Markarian 501. The discovery, reported in a paper published August 18 on the arXiv pre-print server could be helpful in improving our understanding of energetic processes taking place in the universe. Located some 456 million light-years away, Markarian 501 (or Mrk 501 for short) is a blazar or a BL Lac source, with a spectrum extending to the highest energy gamma rays. It is one of the nearest blazars that shines bright in the X-ray and one of the earliest extragalactic sources detected in the TeV band. Within the last decade, Mrk 501 was observed by the Large Area Telescope (LAT) of NASA's Fermi Gamma-ray Space Telescope. A group of astronomers led by Gopal Bhatta of the Astronomical Observatory of the Jagiellonian University in Kraków, Poland, has analyzed the observational data of Mrk 501 collected by LAT between August 2008 and June 2018. The study resulted in the detection of rhythmic oscillations in the blazar's gamma-ray emission. "In this letter, we report the detection of transient rhythmic oscillations in the about 10-year long Fermi/LAT observations of the famous blazar Mrk 501," the researchers wrote in the paper. According to the study, the astronomers found a strong signal of quasi-periodic oscillation (QPO) with a periodicity of around 332 days. They added that the gamma-ray flux modulations in this blazar gradually decayed in strength during the recent years. Furthermore, the researchers emphasized that the gamma-ray QPO in Mrk 501 persisted nearly seven cycles until it finally weakened. Given that not many gamma-ray QPOs have been found to show more than five cycles, the case of Mrk 501, according to the authors of the paper, might be one of the few examples in which astronomers witness a relatively high frequency with a period of less than a year. "What we have observed might be the first interesting event where we witness a transient gamma-ray periodic modulations in the high energy emission of the blazar that persist up to 7 cycles before they gradually fade away," the paper reads. The study also presents several hypotheses about what could be the driving force behind such rhythmic oscillations in Mrk 501. The scientists suggest various scenarios, including supermassive binary black holes, jet precession and accretion disk precessing under gravitational torque. However, the researchers concluded that further analysis of Mrk 501 and discussion on the topic are needed in order to definitely determine the most plausible theory explaining the origin of the oscillations in this blazar.